The Republic of Cyprus (Greek: Kypros; Turkish: Kibris) is an island nation in the eastern Mediterranean Sea, 113 kilometres (70 miles) south of Turkey and around 120 km west of the Syrian coast. Independence: Declared; 16 August 1960, #2 Recognised; from the UK 16 August 1960. The word for the metal "copper" in the English language (and many other languages) stems from the Latin phrase aes Cyprium , "metal of Cyprus", later shortened to cuprum, "copper". Large deposits of copper are found on the island. Historically, Cyprus has always been a bridgehead between Europe and Asia, with interchanging periods of Levantine, Anatolian, and Greek influences. The Republic of Cyprus is the internationally recognised government of the island, and it controls the southern two-thirds of the island. 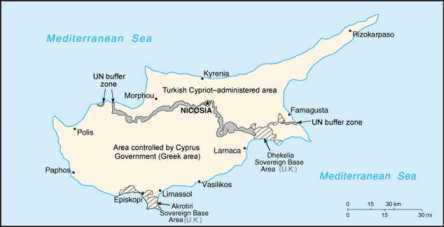 Almost all foreign governments and the United Nations recognise the sovereignty of the Republic of Cyprus over the whole island of Cyprus. Turkish Cypriots, together with Turkey, do not accept the Republic's rule over the whole island and call it the "Greek Authority of Southern Cyprus". They control the northern third of the island, following a military invasion by Turkey in 1974. This happened following a coup sponsored by the military regime of Greece. The Turkish Cypriot area proclaimed its independence in 1975, and the self-styled Turkish Republic of Northern Cyprus was established in 1983. This state was recognised only by Turkey. Furthermore, Organization of the Islamic Conference granted it observer member status under the name of "Turkish Cypriot State". The other power with territory on Cyprus is the United Kingdom. Under the independence agreement, the UK retained title to two areas on the southern coast of the island, around Akrotiri and Dhekelia, known collectively as the UK sovereign base areas. They are used as military bases. Negotiations have been on going for years to reunite the island, but have not as yet seen substantial success. A United Nations plan, announced on 31 March 2004 following talks in Switzerland, was put to both sides in separate referenda on 24 April 2004. On the referendum, the proposed reunification was favoured by the Turkish Cypriots by a majority of 2 to 1, but was rejected by the Greek Cypriots by a 3 to 1 margin. As a result, while officially the whole of Cyprus entered the European Union on 1 May 2004, the de facto EU border runs along the Green Line, dividing the country between the Greek and Turkish Cypriot parts. EU law is currently not applied in the Turkish occupied north. The Union has promised to send aid in the form of money and work towards lifting the trade sanctions imposed by the European Court, but they have ruled out diplomatic recognition of northern Cyprus. As to date, the self declared Turkish Republic of Northern Cyprus, recognized only by Turkey, has yet to see any promised aid or easing of trade sanctions. There are but scanty traces of the Stone Age, but the Bronze Age is characterized by a well-developed and clearly marked civilization. The people early learned to work the rich copper mines of the island. The Mycenæan civilization of the West seems to have reached the island around 1600 B.C. The Greek and Phonician settlements belong to the Iron Age. The island was invaded by Thothmes III of Egypt about 1500 B.C., and was forced to pay tribute. In the eighth century before Christ it was tributary to the Assyrians. Cyprus has been badgered by its powerful nearby nations for more than 3,000 years. In ancient times Cyprus supplied the Greeks with timber for their fleets. In the sixth century B.C., Amasis of Egypt conquered Cyprus, which soon fell under the rule of the Persians when Cambyses conquered Egypt. Alexander the Great (356-323 B.C.) wrested the island away from the Persians. Later, Egypt controlled it, then Rome annexed it in 58-57 BC. During the reign of Trajan (116 AD), an estimated 240,000 people were slain when it was the scene of a rising by the Jews, who were defeated by the Romans everywhere in the Roman Empire about 137 and scattered to many places. Byzantine emperors took control after the partitioning of the Roman Empire, then Arabs took control in 646. Greeks, Arabs, and Byzantine emperors badgered Cyprus until 1184 when Isaac Comnenus of Cyprus made Cyprus an independent sovereignty. The Republic of Venice took control in 1489, after which the Turks invaded and took control in 1570. Cyprus was placed under British control on July 12, 1878 due to the proceedings at the Congress of Berlin. Compulsory reafforestation has been introduced into Cyprus. The Famagusta harbor was completed in June, 1906. Cyprus was ceded to United Kingdom in 1913. The central plain (Mesaoria) with the Kyrenia/Girne and Pentadactylos/Besparmak mountains to the north and the Troodos mountain range to the south and west. There are also scattered but significant plains along the southern coast.